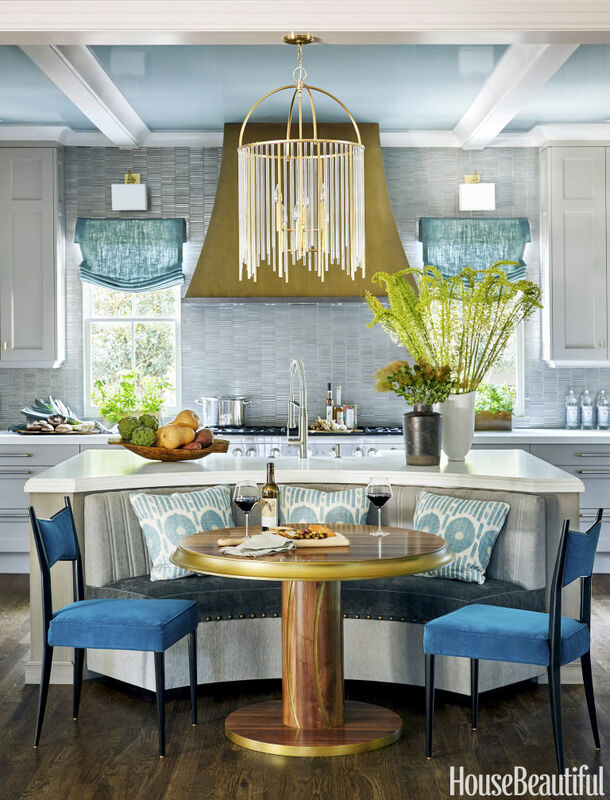 “Efficiency with elegance” perfectly describe House Beautiful’s Kitchen of the Year 2016 designed by kitchen guru Matthew Quinn who captured the homeowner’s passion for the color teal and glamour, successfully transforming her kitchen into the best place to hang out in her home. 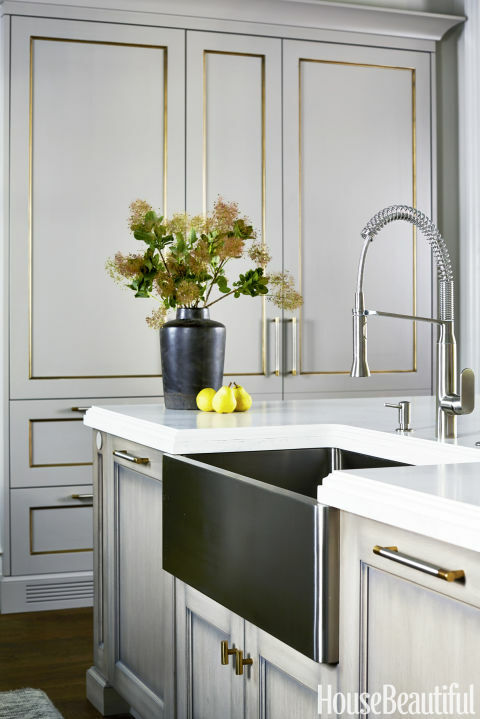 This kitchen of the year is packed with stand-out features and trends that should be paid attention to for your next project. These features make sense in this high-end, luxury kitchen and make the most of the function required to justify the placement. 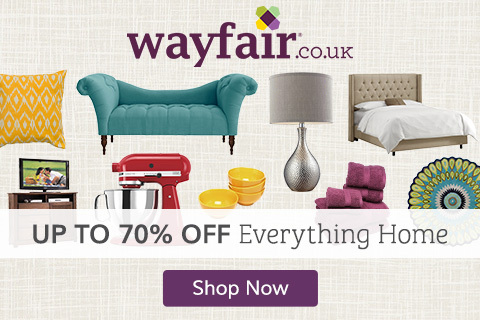 (A product source link is provided below). According to Thermador, this is the first kitchen nationally to house their amazing 60″ Thermador Pro Grand Steam range which comes equipped with a warming drawer and double griddle. 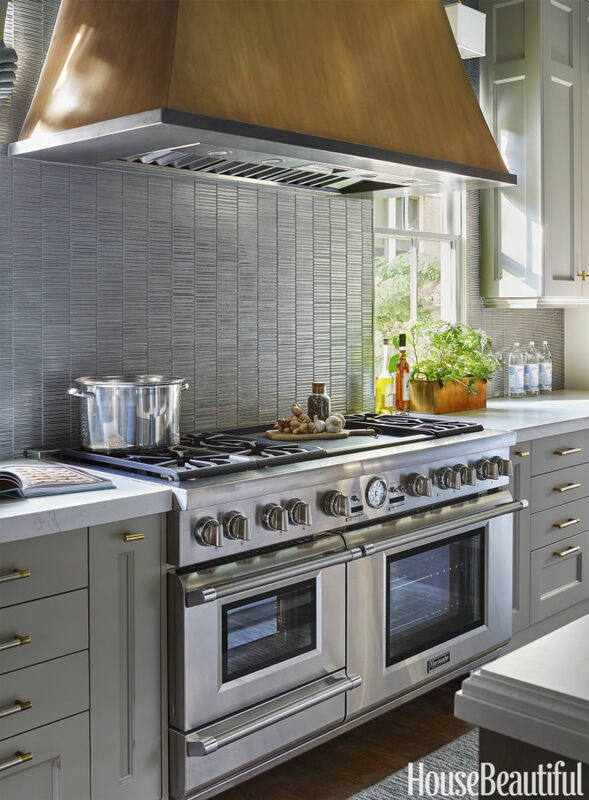 The range is perfectly complemented with a custom Mont Blanc hood made of brass and pewter from Francois & Co. The Thermador Pro Star-Sapphire dishwashers (yes, two dishwashers) handsomely anchor the stainless steel Hillside Sink from DXV. The touchless Grohe kitchen faucet can be used conventionally or activated by a foot-controlled motion sensor. The Thermador refrigerator and freezer appliances are housed behind custom cabinet panels painted in Farrow & Ball’s Dove Tale. 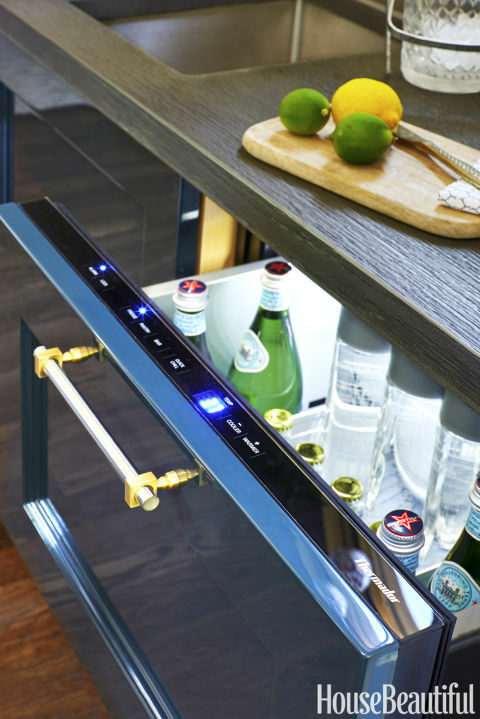 For quick-chill demands when entertaining the undercounter refrigerator drawer adds personalization to the placement of kitchen appliances, a trend in kitchen design. 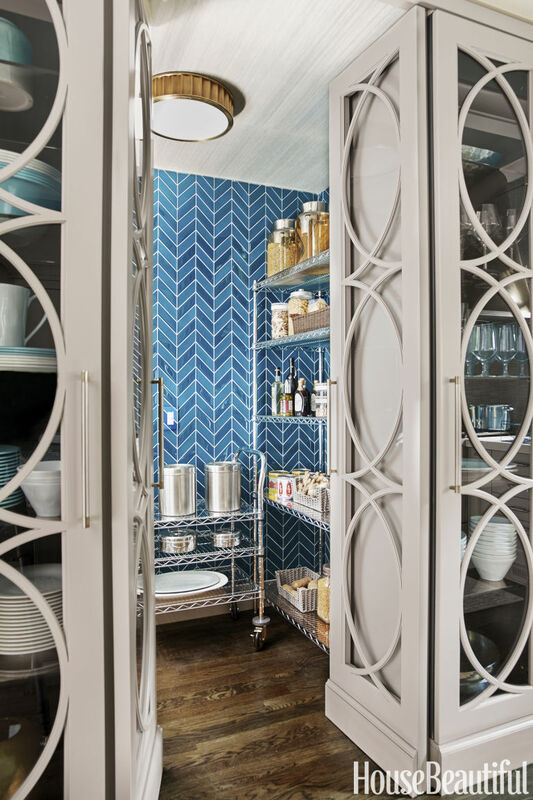 Another wow factor belongs to the walk-in pantry that is stocked with design elements normally reserved for more prominent placements in the kitchen. But lets keep in mind that this pantry is in view from the home’s entry which makes sense to want to glam it up a little. The walls are lined with lagoon-blue AKDO glass tiles, ceiling with Thibaut’s Windward Sisal wallpaper and the mullioned glass doors are the crowning touch. 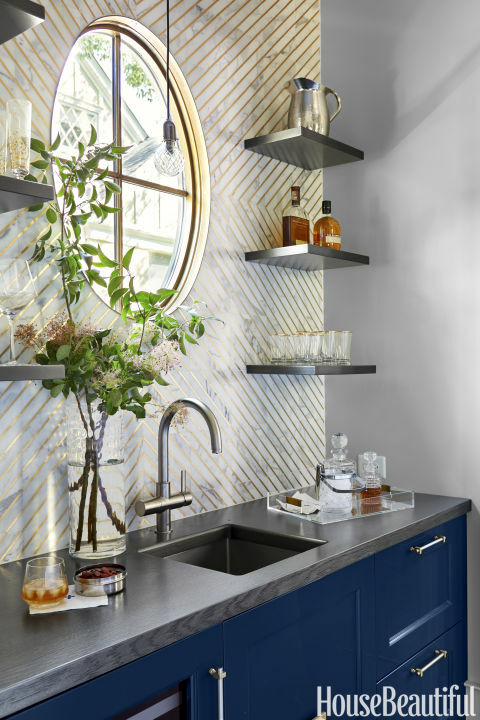 The wet bar captures the eye with its focal wall covered in gold-striped calacatta marble tiles by AKDO arrayed in a sunburst pattern. The Grohe faucet dispenses still, slightly sparkling or fully sparkling water. 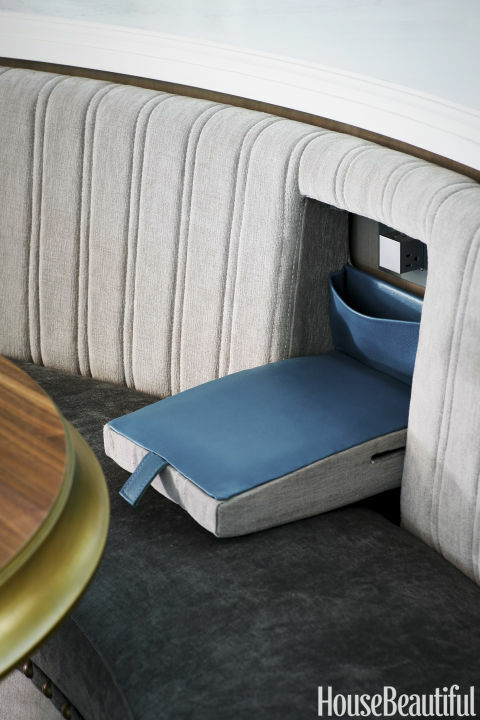 The island was re-designed to incorporate a banquette style seating area as opposed to traditional kitchen stools for dining (a great choice for young families). The booth fabric from Thibaut is stain-resistant Sunbrella upholstery. The Lewis chandelier from Hudson Valley Lighting reminds you that a touch of glam perfectly complements the practical in this space. Finally, you must take a look at the resource list Product Guide in order to appreciate the layers of design and detail required to pull off this House Beautiful 2016 Kitchen of the Year, it is truly a work of inspiration! 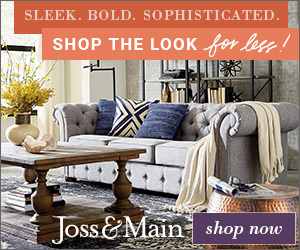 To view the entire photo gallery please visit House Beautiful.